We’re big fans of all four-legged creatures which is why we were delighted when Eseltjiesrus Donkey Sanctuary offered us another two donkeys to adopt. Welcome to the EberVet family Alice and Blondie! 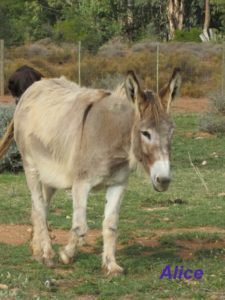 Alice is now 7½ years old and if she had been a working donkey in bad circumstances, would have developed sores, exhaustion and health problems from overwork and lack of rest, incorrect feeding and no deworming. Fortunately, she’s safe from harm, loved and fed and given the proper medical care she needs at Eseltjiesrus. We’ll be sponsoring Alice’s care. Blondie was rescued from a farm where donkeys were bred to be fattened, slaughtered and sold as lion food to small game parks. 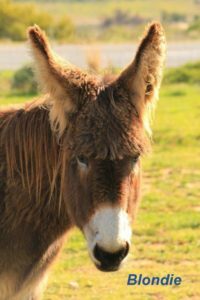 She now lives in peace and quiet and in harmony with a group of friends at the wonderful Eseltjiesrus Donkey Sanctuary in McGregor and EberVet Pet Clinic is contributing to her upkeep. Blondie’s early experience of humans made her shy and nervous and it has taken time to build her confidence and trust but we’re delighted to report that she is slowly learning that not all humans want to harm her. Blondie, named for the blonde streaks in her ears and mane, now spends her days grazing in large fields behind vineyards.